Toruń is one of the leading places on the list of Polish cities that must be visited. Anyone who has ever had an opportunity to walk around the Old Town, eat gingerbread and drink coffee among the Gothic walls can confirm it. It is also a city which makes you want to come back and tie your professional life with it. Not only the unique charm and atmosphere of the city attract many people to study, work, but also to settle down in Toruń. It is a good place to live. Charges are lower here than in other cities. It provides you with breathing space, fosters the development of passions, and attracts with cultural, musical and sports events. There is no place for boredom in Toruń. This city is vibrant without being overwhelming like big metropolises. Students who come from all over Poland to spend here the best time in their lives and stay here to work, set up families, develop their passions and businesses can assure you of that. The Old Town, gingerbread, Copernicus ... of course, but Toruń is not a museum. It is a city that is intensively developing, offering entrepreneurs excellent facilities for investing. Our city is located in the central part of Poland and has access to the A1 highway, from where in less than 2 hours we can get to Gdańsk or Łódź. 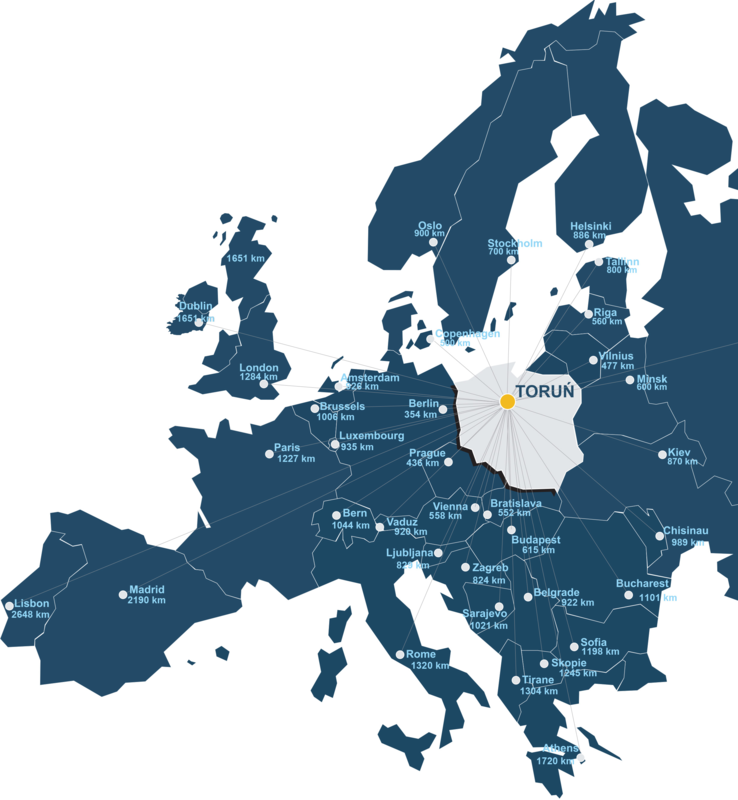 Transport is also facilitated by a well-developed railway network and the International Airport in Bydgoszcz, situated less than 50 km away from Toruń. For entrepreneurs who want to develop their businesses, Toruń offers perfectly prepared investment areas, located beside national roads, with suitable infrastructure. The emerging investments and fast developing housing estates prove that Toruń is not only a perfest tourist destination, but also an ideal location for business and everyday life.